IF LONDON’s often abysmal infrastructure had got its way, I would not have reached Craven Cottage on time for Fulham’s second Premier League home game of the season. Train delays, tube disruptions, over-crowding from the Notting Hill Carnival and to top that, incessant rain. Normally, that wouldn’t bother me, but a damaged knee made the journey all the more challenging. Hopefully, the game would compensate. “I don’t understand it, Fulham’s ground is in Putney, Chelsea’s in Fulham and West Ham is in Stratford. Why can’t they be bloody simple down south…Burnley is in Burnley,” said one die-hard Burnley fan at Earls Court, trying to fathom out where the hell Parsons Green was. They soon found out and I walked part of the journey behind them as we travelled along Fulham Road, passing an estate agent on the way. “Jesus Christ, have you seen how much these houses cost down here,” said one claret and blue clad fan. “F*** the houses, look how much a loaf of bread is in this bakery,” replied another. “They must be f****** mad around here, paying that much for a bit of bread.” Fulham, with house prices averaging £ 1.1 million, is that sort of place and hardly representative of London as a whole. I noticed an ad for basement excavations in one window. Burnley had just returned from a midweek Europa League tie in Greece, losing 3-1 to Olympiakos. While Fulham had played just two competitive games in 2018-19, Burnley were facing their eighth match since July 26. With a relatively modest squad, Sean Dyche’s players might be in danger of fatigue before the end of August. They’re also on the brink of European elimination to a team that shouldn’t really be causing them too many problems. The Thursday night tie in Athens meant the Fulham game had to be switched to Sunday. Fulham, meanwhile, were in desperate need of some points after losing their first two games. Although the season was just a fortnight old, the £ 100 million investment made it an imperative that sooner, rather than later, Fulham had to justify their expenditure. Not that they had played badly in the first two Premier outings, but defeats can soon have an impact on morale. Burnley made seven changes to their starting line-up for the trip to Craven Cottage, including goalkeeper Joe Hart, who was signed in the summer from Manchester City for just £ 3.5 million. Hart’s career has never really recovered since being sidelined by Pep Guardiola, but he didn’t deserve the taunting, “you let your country down”, which came from the Hammersmith End. This abuse aimed at former internationals has become something of a trend and may owe its roots to the rising tide of faux nationalism that has emerged in the aftermath of the UK’s decision to leave the European Union. Whatever the reason, former England players do not need it. Frank Lampard received a similar reception at Millwall a week earlier. Fulham manager Slaviša Jokanović juggled his resources and made five changes, resting goalkeeper Fabri and bringing back Marcus Bettinelli as well as fielding André Schürrle, Kevin McDonald, Denis Odoi (first game of the season) and a first start for on-loan striker Luciano Vietto. Jokanović said in his pre-match comments that a team with a host of new signings will take some time to adapt to the Fulham style. But he admitted he was aware “we can play better football than we have so far shown in the first two games…only a few players have competed in the Premier League before, so this is a new experience.” It was an ideal time for Fulham to get off the mark and take advantage of a possible European hangover. It didn’t take long for Fulham to make their mark. Jean Michaël Seri, in the fourth minute, receiving the ball from Luciano Vietto. Seri beat one man and then unleashed a 30-yard shot that gave Hart no chance as it headed for the top corner. Six minutes later, Fulham’s defensive weaknesses came to the fore as Jeff Hendrick was allowed two bites before shooting high into the net. 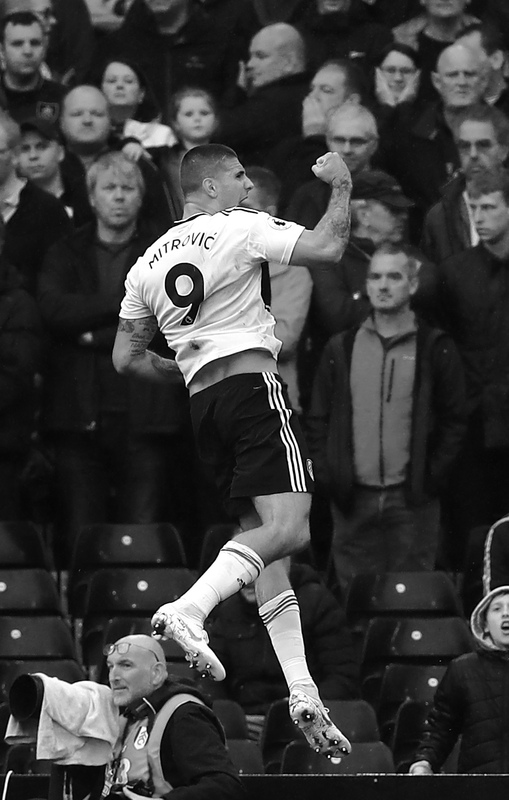 Fulham looked impressive going forward, with Aleksandar Mitrović always a handful for the Burnley defence. In a three minute spell towards the end of the first half, he struck twice. The first goal, in the 36thminute saw him nod home at the far post from a nicely-weighted cross by Tom Cairney. Burnley scarcely had time to draw breath as “Mitro” added another goal, his third in three games. This time, Vietto crossed to the near post and he sent a glancing header past Hart. If there is a name that lends itself to mass chanting, it is surely his – “Mitro…Mitro”. He’s something of an old fashioned centre forward, a battering ram, but his movement and focus requires technique – Newcastle, hgis former employer, could do with someone as effective. He’s also good to watch. Burnley pulled a goal back in the 41stminute, James Tarkowski finishing off after Ben Mee headed on a corner, underlining Fulham’s occasionally soft underbelly. Five goals in one half – it was inevitable the second half would be less frenetic, but Fulham continued to play with flair. The decider came in the 83rdminute when Mitrović sent a left-foot drive against the post and the ball rolled to the impressive Schürrle, who confidently set himself up before shooting low and wide of Hart. There was even time for Ryan “he’s one of our own” Sessegnon to make an appearance as Fulham’s fans enjoyed their first win back in the Premier League. On the evidence of this performance, they’ll be plenty more for them to savour. It was, without doubt, one of the most enjoyable games I had seen for some time. Plenty of goals, individual performances to appreciate and a raucous but very acceptable atmosphere. I’m heading for Brighton next week to see Fulham on the road – the first time I’ve been an “away fan” for some years – perhaps decades! Previous Entry Football Media Watch: Fall of the Roman Empire?